Одноголосное сольфеджио. Ноты. 4-е изд., стер. Ladukhin Nikolai Mikhailovich (1860–1918) was a Russian music theorist and a composer. 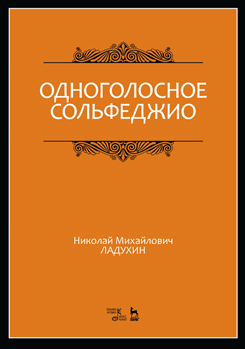 “One-part solfeggio” approved itself in pedagogical practice to be a unique study guide for the development of a prima vista on all the levels of music education (from the beginning level to universities). The book is intended for the students of music schools, colleges and academies of art.